It's a very minimal design featuring a white border and lots of room for the photo. The nameplate on the bottom stands out with a sunburst feel to it. 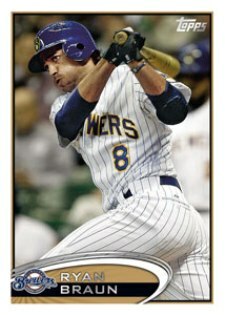 Just the one image of Ryan Braun was teased, however expect more to come. this design is boring, and not very creative. The inserts are decent, the rest is pretty bad. Looks cheap. I know the 61st of anything isn’t really all that special, but don’t you think Topps could spend more than 30 seconds putting together a product that has the potential for millions in revenue? If I’m on the Topps future design committee, my FIRST act would be to poll collectors (obviously a large task, but we’re taking a leap in reality already, right?) and find out what the CONSUMERS WANT. Find a way to make each year’s set special/unique and we might actually see some kind of resurgence in the popularity of set collecting. But hey what do I know, I only buy the stuff….well not next year’s.